Our house is based in the small mountain village of Anidri, a perfect base for hiking or relaxing in the quiet surroundings of beautiful and unspoilt Southern Crete. The apartment is gorgeously situated between mountains and right by the entrance to a 'little Samaria' - a gorge that leads to Anidri beach. It is a hike that takes between 30 and 40 minutes. From our house, there is a wonderful view over the Libyan sea, surrounded by mountains. 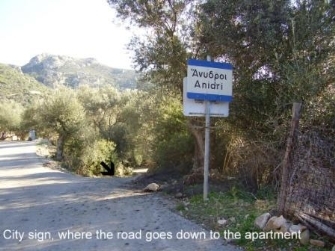 Anidri is a very small village with many different nationalities. The village's many nations meet at the beautifully situated cafe, the old school. The cafe is famous for its good home cooking. And if you want to learn how to cook Greek dishes we can recommend Cooking Classes with Georgia. 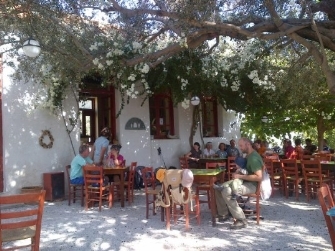 Anidri is located 5 km from Paleochora, which has many nice cafes and restaurants. There are two large supermarkets and many smaller shops, catering for everything you need on a holiday. The bakery shops offer freshly baked bread every day, and you can buy every imaginable flavour of ice cream, including ice cream made exclusively from goats' milk. During the summer, the main street is closed to traffic at 19.00 and all the restaurants come out with their tables and chairs. You can read more about Paleochora here and here. Our house is the last bit of civilization on the walk down the gorge to Anidri beach, where you can find isolated bays as well as more populated areas with 2 cafes and beaches with deck chairs and umbrellas. Bob and Lynn Tait have written 2 books: "10 walks" and "10 more walks" that will be available for you in the apartment. You can also follow Bob Tait online. There are regular buses several times a day between Paleochora and the airport town of Chania. Other buses connect Paleochora with Azogires, the Omalos mountains and the Samaria Gorge. Also on offer are organised walks through Anidri Gorge, Samaria Gorge, collecting herbs and to nearby archaeological sites. The region is well known for several Byzantine chapels, adorned with wall paintings. During the summer months a regular ferry including car transport travels between Paleochora and the coastal villages of Sougia, Agia Roumeli (the coastal end point of the Samaria Gorge, Loutro and Chora Sfakion. Boats are also available to Elafonisi beach, the bay of Lissos and also to Europe's most southern point, the unspoiled island of Gavdos. Boat trips are also organised locally to watch dolphins and whales. You can rent bicycles, scooters and cars at the local NOTOS. If you want to rent a car from the airport in Chania we can recommend Autoclub car rentals.